Combining a scenic coastline and an atmosphere of traditional hospitality, Pissouri is the perfect destination for a true Cypriot experience. On the 23rd (Sat), explore the striking landscape at Aphrodite's Rock, then get interesting insight from Tours, then look for gifts at O'Vrakas Gifts, and finally make a trip to Pissouri Village Square. To see ratings, traveler tips, where to stay, and more tourist information, go to the Pissouri trip itinerary builder site . Paphos to Pissouri is an approximately half hour car ride. You can also do a combination of bus and car. Expect a daytime high around 22°C in March, and nighttime lows around 11°C. Cap off your sightseeing on the 23rd (Sat) early enough to go by car to Ayia Napa. Kick off your visit on the 24th (Sun): see some colorful creatures with a scuba or snorkeling tour and then contemplate the waterfront views at Blue Lagoon. Keep things going the next day: enjoy the sand and surf at Nissi Beach, then take some stellar pictures from Sea Caves, and then get a new perspective on things with Boat Tours & Water Sports. 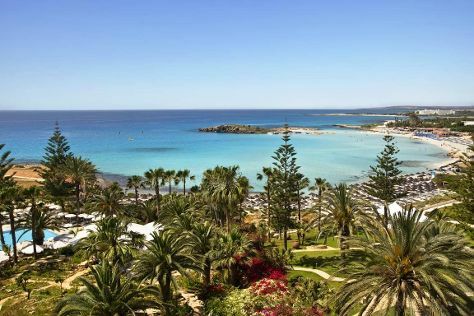 To see ratings, photos, maps, and more tourist information, read our Ayia Napa online trip itinerary planner . Traveling by car from Pissouri to Ayia Napa takes 2 hours. Alternatively, you can take a bus. In March, plan for daily highs up to 23°C, and evening lows to 10°C. Wrap up your sightseeing on the 25th (Mon) to allow time to drive back home.